Camera drones have revolutionized the way that images are captured. Figuring out which type of camera drone is right for your needs is difficult, though. After all, these drones aren’t inexpensive and making the wrong purchase can set back your filming plans by quite a bit. 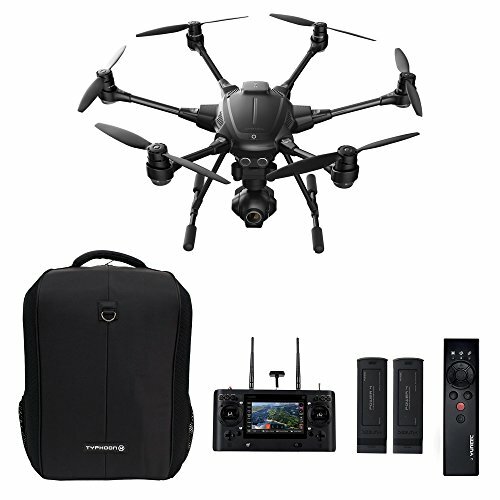 That’s why this Yuneec Typhoon Q500 4K Quadcopter Drone review has been put together, to take an objective look at a 4K camera-enabled drone and to figure out if it meets your needs. Figuring this out requires taking a look at the drone’s value, usability, and even the opinions of other buyers. This 4K-enabled camera drone is a combination of friendly flying and professional-grade camera mount. With an easy-to-assemble set-up and a remarkably user-friendly controller, it’s one of the few units that manages to bridge the gap between the professional and consumer grades. Shipped with a number of great accessories for capturing images, this is one drone that’s really made for camera work. During this Yuneec Typhoon Q500 4K Quadcopter Drone review, we found the drone incredibly fun to fly. Most 4K drones are useful, of course, but fun doesn’t really sum up the flight function. You don’t need to be a professional to get a lot of performance out of this drone, though at its price point you definitely don’t want to leave it with a novice. It’s very responsive and does a great job keeping itself in the air. As you might expect, this drone needs to be flown outside. It can theoretically be flown inside, but you’ll be ignoring most of the best functionality. While it’s got good performance in the air just as something to fly around, this is also a drone that absolutely needs to be used by someone who will be taking video. Everything about this drone is clearly designed with video in mind, so ignoring that functionality is ignoring the purpose of the drone. One of the best parts of conducting this Yuneec Typhoon Q500 4K Quadcopter Drone review was getting to use the drone’s controller. An absolutely spectacular piece of engineering, this remote control is a fantastic mix between a traditional remote control device and a modern touchscreen. It has the analog sticks that you need for precise piloting, of course, but it also has a great touchscreen interface that makes it easy to keep up with everything your drone sees while in the air. This is honestly one of the best controllers you’ll ever get a chance to fly with. While it’s usually nice to have a few accessories, it’s hard to point out just one here that’s better than the others. All of these accessories are great, but the Steady Grip is perhaps the most interesting. This tool lets you use the camera from the ground, using your own phone as a viewfinder. It’s one of the best camera tools you’ll find with any drone. There are plenty of drone pilots out there, some of who have very strong opinions about this drone. We’ve gathered up a few in the process of conducting our Yuneec Typhoon Q500 4K Quadcopter Drone review, and we think it’s important that you see what they have to say. A number of users note that the drone is very easy to fly right out of the box. While this might seem like a given, this isn’t always the case with higher-end drones. Like most users, this one also considers the drone to be an excellent choice. Another user also enjoys flying the drone but has had some significant issues with image quality. This certainly isn’t something you want to see in a 4K-enabled drone, and it seems that even getting high-quality SD cards doesn’t help. A third user had a bad experience with the drone. This user saw his or her drone destroyed when the engine cut off without warning. Despite a fully-charged battery, this user watched a fairly expensive drone smashed to pieces due to some kind of fault. What the verdict of this Yuneec Typhoon Q500 4K Quadcopter Drone review? When all is said and done, this is a great drone. Yes, there have been reported problems but more users are happy with their experience than not. Given how easy it is to fly and how great the included tools are, choosing this drone should be easy for anyone who wants to take high-definition video. This Yuneec Typhoon Q500 4K Quadcopter Drone Review was only based on our experience, though, and you may have your own with this drone. If you’ve got something to say about this drone or our review, don’t keep it to yourself – get in contact with us today.